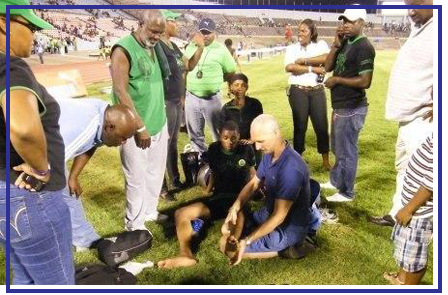 Osteopath Torben Hersborg giving treatment for sprained ankle at an athletics meet in Kingston, Jamaica, with top Jamaican sprints coach, Glen Mills. resulting in damaged ligaments, usually on the outside of the ankle joint. Ankle sprains are classified by a graded scale of severity from a slight stretch of the ligament with no tears to a complete tear of the ligament – sometimes with an avulsion fracture, where the ligament rips a small piece of bone off. This will require more treatment and rehabilitation to avoid serious chronic issue. What prevents the ankle sprain from healing is that the ankle joint can stay misaligned and continuously strain the ligaments and maintain wrong weight bearing on the ankle joint – this can result in an unstable ankle joint lasting many years. This page focusses on the common sprained ankle injury, how to do first aid for an ankle sprain, how to do ankle rehabilitation exercises and a bit about ankle sprain treatments. Most ankle sprains happen by rolling the ankle inwards and thereby pulling the ligaments on the outside of the ankle which then will be very painful, swell up and bruising can happen in the next few days. The first aid for ankle sprains is to reduce the swelling by icing it as soon as possible – preferably witlhin a minute. At the same time you will put compress on it to further stop it from swelling. If you elevate your leg the swelling is helped moving away from the sprained ankle. A typical ankle sprain will involve a torsion of the ankle bone (talus) where it sits below the tibia and fibula. This can cause further damage and pain to the ankle joint when weight bearing on it. Therefore rest is required until the joint is realigned. As well as the above first aid tips for ankle sprains you should mobilise your ankle without weight bearing. We will show you some ankle sprain exercises on this page. – (under development). 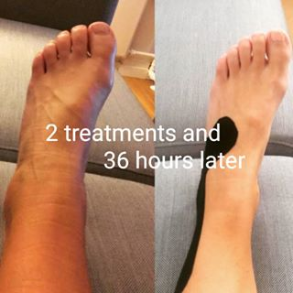 What is the best treatment for a sprained ankle in London? Proper treatment of a sprained ankle can speed up recovery and prevent re-injury or chronic problems. Our osteopaths and physiotherapists in London work gently and precisely, adjusting the ankle into its best position and giving you rehabilitation exercises to get better quickly. As other structures, such as the knee, might be affected, we will also look into the mechanics of local and often distal areas of your body. You can have treatment for ankle injury as soon as the injury occurs. In fact the sooner you get treatment for ankle sprains the better. One of our osteopaths from Central London Osteopathy and Sports Injury Clinic has even been described in several newspaper articles as a “miracle man” for ankle sprains when he helps a top athlete competing (and winning) less than a day after initiating the treatment for the acute ankle sprain which has cribbled the athlete. What is the best treatment for sprained ankles? Most sprained ankle have a mechanical reason to be there and as such a mechanical approach such as osteopathy or physiotherapy are ideal methods to free up the compressed joints and stiff muscles plus advicing on correct ankle sprain exercises. At the Central London Osteopathy and Sports Injury Clinic we see sprained ankles very often, so we have a lot of experience in lower back pains. People usually would see one of our osteopaths or physiotherapists for sprained ankles – and conveniently based in Central London we often can see you on the same day if you book early enough. If you want to find a sprained ankle clinic near me look no further. How do I find the best osteopathy clinic in London?